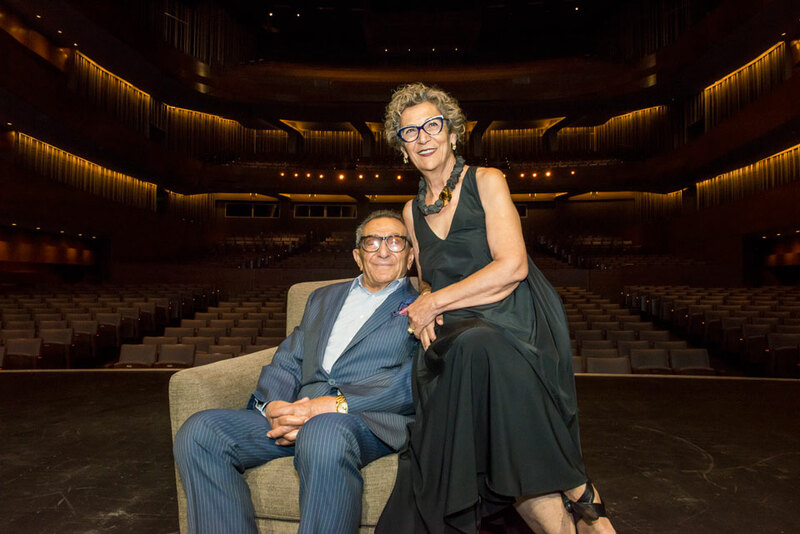 The Valley Performing Arts Center has been renamed the Younes and Soraya Nazarian Center for the Performing Arts in honor of Younes and Soraya Sarah Nazarian (above). Photo by David J. Hawkins. “Through this historic and transformational gift, Younes and Soraya Nazarian are investing in the elevating power of the arts and in the artists who enlighten and inspire us all,” Harrison said. “The Nazarians’ generosity is unlike any CSUN has ever experienced. The Nazarian family has made a profound and lasting impact on CSUN and the entire region. Younes and Soraya have ensured that we can continue to deliver the finest music, dance and theater events, engaging communities throughout Los Angeles and Southern California. The center will officially be named the Younes and Soraya Nazarian Center for the Performing Arts, with “The Soraya” its preferred shortened name. The new name will be used informally throughout the 2017-18 season and formally unveiled at the start of the 2018-19 season. Signing the final documents for the naming of the Younes and Soraya Nazarian Center for the Performing Arts. From the left in the front row: Soraya Sarah Nazarian, Younes Nazarian and CSUN President Dianne F. Harrison. From the left in the back row: Sharon Nazarian, president of the Y&S Nazarian Family Foundation, Thor Steingraber, executive director of the Younes and Soraya Nazarian Center for the Performing Arts, and Robert Gunsalus, CSUN’s vice president for University Advancement and president of the CSUN Foundation. Photo by David J. Hawkins. Soraya Sarah Nazarian noted that the arts have enriched her life and highlighted her desire to share that gift with others. “CSUN’s commitment to making the arts accessible, its inclusive approach to artistic programming, the university’s deep diversity and its vital place in the community all contributed to our family’s decision to make this investment,” Soraya Sarah Nazarian said. Businessman, investor and philanthropist Younes Nazarian and his wife Soraya, an internationally recognized sculptor, said they made the gift — one of the largest in Los Angeles arts history — because the mission of the center aligned seamlessly with the family’s own values. The Nazarian family’s support for CSUN started in 2014 when their son, David, a prominent businessman, philanthropist and CSUN alumnus, made a transformative gift that was recognized by the naming of CSUN’s business college as the David Nazarian College of Business and Economics in 2014. In 2016, Younes and Soraya donated 50 laptops to deserving business students and were also title sponsors for the 50th anniversary celebration of the David Nazarian College of Business and Economics, an event that capped a two-year, $25 million fundraising drive for the college. Most recently, Soraya Sarah Nazarian, a renowned sculptor, created and donated a majestic and moving original sculpture, named “Unbound,” that will soon be installed at CSUN’s Nazarian College. “The Nazarians are part of a growing number of savvy LA philanthropists who see the broad elevating force of the university and know that, through CSUN, their investments will have an amplified impact on the region,” Gunsalus said. The Nazarians moved to the United States in 1979 with their four children, fleeing the religiously targeted violence and demonstrations that led up to the Iranian Revolution of 1979. Drawing on the entrepreneurial acumen he had in Iran — where he helped establish one of the largest import/export companies of construction machinery and equipment in the region — Younes Nazarian, soon after his arrival in the United States, became co-owner of Stadco, a tool and dye manufacturer of specialty parts in the aerospace industry. He was an early investor and served on the board of directors of San Diego-based Qualcomm, Inc., a leader in wireless telecommunications research and development. While her husband built businesses, Soraya Sarah Nazarian pursued her passion for art, establishing her own studio in Los Angeles. She is a master in the medium of direct carving in stone. Her work carries themes of motherhood, family, spirituality and Iranian culture. It is distinguished by two major periods: a time of discovery and experimentation in the 1980s and 1990s, and a period of artistic self-confidence marked by the creation of large-scale pieces beginning in 2000. In 2000, the couple founded the Y&S Nazarian Family Foundation, whose charitable giving focuses on supporting educational causes through a multipronged approach in academia, public policy and the arts. The Y&S Nazarian Family Foundation is led by Younes and Soraya’s daughter, Dr. Sharon Nazarian, who, as a respected academic and cultural leader, was well-equipped to shape the vision for this landscape-shaping investment. “CSUN is one of the most diverse universities in the country, in one of the most diverse cities in the world. We are proud to support its commitment to the arts — and to work with The Soraya’s passionate, creative and innovative Executive Director Thor Steingraber to improve education and cultural life for generations of Angelenos,” Dr. Sharon Nazarian said. In six years since opening its doors, The Soraya has grown to become one of LA’s most respected venues, and musicians often make it one of their regular stops on their North American tours. In the past three years, Steingraber has grown and diversified The Soraya’s programming to include Latin and Mexican regional music, jazz, and family programs in its exciting programming mix. In keeping with 20 years as a Los Angeles arts leader, Steingraber has also welcomed many Los Angeles artists and musical ensembles to create and present original work that might otherwise not find a home. As the artists on stage have diversified, so have the audiences, growing to reflect one of the nation’s most diverse campuses, as well as the diversity of Los Angeles itself. The Soraya extends its impact to the K-12 schools of the San Fernando Valley, serving up to 10,000 students annually with its arts education programs. “The Nazarians’ gift goes a long way to securing a future of great music and performances worthy of such an exceptional venue, and more so, their visionary leadership reflects the values of the arts in the 21st century, especially accessibility and inclusion,” Steingraber said. More information about the Younes and Soraya Center for the Performing Arts can be found at www.valleyperformingartscenter.org. More information about CSUN can be found at www.csun.edu. doctorates in the sciences. The Hollywood Reporter ranked CSUN’s film and music programs in the top 25 in the country. Variety magazine agreed, ranking CSUN’s film program in its top 40 in the world. In 2000, Younes and Soraya Nazarian founded the Y&S Nazarian Family Foundation in Los Angeles, The Foundation is driven by the core belief that the promotion and support of education is the most important catalyst for societal change. The Foundation is interested in planting seeds, building bridges, and enabling pioneering thinkers to imbue their knowledge into today’s global community. The Foundation has made investments at all educational levels — elementary, high school and university. The goals of the Foundation remain focused on enriching institutions of excellence through investments in capital campaigns and existing programs, as well as establishing and nurturing new programs with the goal of providing students with educational tools that enhance and enrich their learning experience. The Foundation takes great pride in giving back to less privileged communities, both in Los Angeles and around the world. Enriching the lives of all through the arts and culture is an area of great importance to the family. Soraya Nazarian is an acclaimed sculptor in her own right: her direct carvings in stone have been praised for their exploration of the themes of motherhood, family and spirituality. The cause is equally supported by her husband, acclaimed businessman, investor and philanthropist Younes Nazarian. For his many charitable works, in 2011 Younes Nazarian was awarded Ellis Island Medal of Honor for outstanding citizenship, individual achievement and encouragement of cultural unity. Whether through investing in music and dance academies in Israel or inner-city art programs in Los Angeles, the Nazarians are committed to using the arts as a tool for learning, teaching tolerance and confidence-building for children. The Foundation intends to continue its extensive philanthropic endeavors in this arena in the years ahead. Younes and Soraya reside in Los Angeles and have four children, Sharon, David, Shulamit and Sam, and nine grandchildren. In 2014, CSUN renamed its college of business the David Nazarian College of Business and Economics in honor of alumnus David Nazarian’s $10 million gift to the university and recognition of his leadership of a $25 million fundraising drive. Dr. Sharon S. Nazarian is the President of the Y&S Nazarian Family Foundation. Since his appointment in 2014, Steingraber has brought acclaim to the Valley Performing Arts Center, now to be known as The Soraya. The 1700-seat venue, located in the heart of the San Fernando Valley, has come to be known as home to many Los Angeles artists and arts organizations, and Steingraber’s lifetime experience as a producer has brought to VPAC some of the most innovative and diverse programming in the region. Previously, Steingraber was vice president of two of the nation’s largest performing arts centers — The Kimmel Center in Philadelphia and The Music Center in downtown Los Angeles. In his time at The Music Center, Steingraber was responsible for opening Grand Park and establishing the vision that has made that park vital to LA, as the home to many celebrations and holidays. Steingraber’s artistic career spans more than 20 years, directing at major venues from Lincoln Center to theaters in Europe and Asia. But Los Angeles has always been his artistic home. He directed his first major opera production at the Dorothy Chandler Pavilion in 1996. Steingraber is a graduate of the Harvard Kennedy School and was its first Fellow for Arts and Culture.